Raphael asks: When should I use “a” and when should I use “an” before the different words? For example, should I say “a hour” or “an hour?” I stumble over this everytime and dont’t know if I’m getting it right, as I’m not speaking and writing English natively. 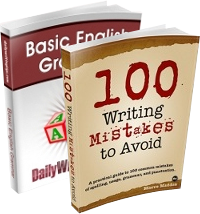 The rule states that “a” should be used before words that begin with consonants (e.g., b, c ,d) while “an” should be used before words that begin with vowels (e.g., a,e,i). Notice, however, that the usage is determined by the pronunciation and not by the spelling, as many people wrongly assume. You should say, therefore, “an hour” (because hour begins with a vowel sound) and “a history” (because history begins with a consonant sound). Similarly you should say “a union” even if union begins with a “u.” That is because the pronunciation begins with “yu”, which is a consonant sound. Deciding which version you should use with abbreviations is the tricky part. First of all you need to understand if the abbreviation is pronounced as a single word or letter by letter. Similarly, you should use “an NBC reporter” (because “NBC” is pronounced “enbisi”) and “a NATO authority” (because “NATO” begins with a “ne” sound). Thanks Rohit. In fact this is the first post answering “readers’ questions.” If you have any feel free to ask us! Nice, clear explanation of a/an. Question: did you mean to write “yo” to represent the “y” sound in “union”? It’s tricky to represent sounds without using the phonetic alphabet, but I think something like “yuh” would be closer to the consonant sound of the letter Y.
Maeve, thanks for taking the lead regarding the phonetic alphabet. I tried to research a bit, but indeed “yu” is closer to what I was trying to express :). I’ve been wondering about this for a while, and why is ‘historian’ after ‘an’? I think you are right to say we use “an” depends on the sound. We may say: use “an” before a word that begins with a short vowel sound? Leah, I am not an expert with the phonetic alphabet, but it looks like “union” begins with a “yu” sound, and not a “u” one. I will research a bit and post what I find here. Great tips I didnt know that it depends on the pronunciation. Glad I found this blog (through Yaro). Where does the word ‘hotel’ fit in though. I have seen it written(and pronounced) as ‘an hotel’ where the ‘h’ is not sounded and ‘a hotel’ where it is. Become a hero. Hero does not begin with a vowel sound; it begins with the consonant sound for H. The same should apply for hotel too. If you said hotel by itself and didn’t pronounce the H, it would sound like “otell”. That cannot be correct. I think it should be “a hotel” as in “a hoe tell everybody”! your blog gives lotz of basic knowledge which most people doesn’t know. i really appreciate your efforts. all the best. Back then all I know was “a union” and “an hour” which used the exception of using “a” and “an” before words. It depends on how it pronounced. And now I know that “an NBC” and “an LWR” are also using the same exception. Thanks! The answer depends on how you say it. I say it is “an MAT” because I am assuming that when you say the title you say each individual letter (M-A-T), like you would with MBA. But, a friend was saying it like the word “mat” and thought it was “a MAT.” To get the right answer, you need to know if people say each individual letter, or do people sound it out and say “mat.” Is anyone familiar with MAT and how you say it? It makes all the difference. It is very clear explaination. I just know the using “a” or “an” . It not depends on vowels or consonants but also pronunciation. Daniel, what do you think about an E-Mail? I’ve seen “a”, “an”, and nothing at all. I usually use “an”, but please, correct me, if I am wrong. I was never aware of this, awesome work man!! So far i went wrong when taught student in elementary school. I always thought that, an–> always followed by vowel. Lucky me, because i find this explaination. I want to improve my english language.I thin that may english is not well. so please give me suggestion.Really!I need to improve english language. I am a hardworking person, wiiling to undergo trainings. I want to enhance my knowledge in different fields of work. I want to meet different people with different walks of life. 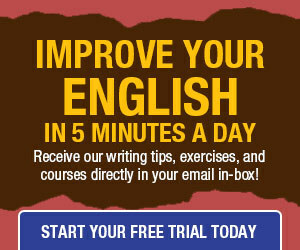 Well, i just saw your post here desiring to improve in English. I felt for you because we have the same interests. I just to know how you get started. how and when to use “the” as article? A question. If you are using an abbreviation that you expect people to look at and pronounce the actual word it represents in their mind and not pronounce the letters of the abbreviation would you base the a/an article on what you expect the reader to think in their mind or be strict and go by how the letters of the abbreviation would sound. I think it is most natural to use what the sound the reader is probably imagining in their mind. i am not good in writting english. all time i thinm that i am not writting in correct form. onthe other hand i am not known about the all rule of writting in english. I have strong determination for to do well. If it is helped i will be thanking to him. I am not good in writting English.I need helping .Thank you a lot. this is a contradiction to what you’re stating. Please explain this one, because the LWR doesn’t sound like a vowel to me. @Wyatt, LWR starts with an “l”. I am not good at the phonetics alphabet, but that sound is similar to “ehl.” Do you see why it is a vowel sound? Wyatt, in common usage, NATO is pronounced as a word. ‘Nay-toe’. So the ‘A before consonant’ rule applies. LWT is an acronym, just like NATO, but it doesn’t look like a word, is not a common English word, so it is spelled out when pronounced. Ell-double-You-Are. The leading L is a consonant, true, but when you pronounce ‘Ell’ you have a vowel sound. Thus, ‘An before a vowel sound’. The rule goes by the sound of the word, not the strict classification of the first letter, whether that first letter is a vowel or a consonant. You noticed that the examples of ‘hour’ and ‘history’ require one to recall that when spoken, the leading ‘H’ of hour is silent, ‘hour’ is pronounced the same as ‘our’. Both ‘hour’ and ‘our’ expect an ‘An’ before it, since the rule applies to the spoken sound, in common usage. Another confusing term, like NATO, is ‘herb’, as in an herb garden, or garden herbs. Correct usage is to leave the ‘H’ silent, making it ‘an herb salad’. What gets confusing is the large number of people that mispronounce the word, making it sound like ‘Herb’ as in a short form of the name Herbert. If you are rattling off guy’s names, that would be a Sam or a Herb or a Willy. I have also heard the word “herb” pronounced “yarb”, which begins with a ‘Y’ sound, which common conventions agrees is a leading consonant sound. A herb (‘yarb’), a yes, a yellow spotted rhododendron – the ‘Y’ is a very versatile (or maybe just ambiguous) letter. I do understand about using an with the vowel sounds. but what about the apple, why an apple not a apple? Is it because of the difficulty in saying a apple compare to an apple? I do understand the rule of using a and an (with vowel sounds for the first letter of the word). My question is why the apple we use an apple not a apple? Is it because it’s difficult to pronounce a apple than an apple? Please give me a hint. suda, because the “a” in apple is a vowel and it makes a vowel sound, so you use “an” before vowel sounds. the vowels are: a,e,i,o,u and sometimes y. and for people older than 40 sometimes “w” ! but i’m under 40! so i don’t know why. thanks – I thought maybe the rule had changed since I was in school because I see the opposite usage of a and an so many times in newspapers – did newspaper style change or do they just get it wrong very often? All students of English should know this site’s URL and refer to it when in doubt. Teachers in particular should just give the URL out to their students, thereby avoiding some long explanations in class.